“Move over Machiavelli, step aside Sun Tzu. If you want to know how to defeat your enemies and hold on to power the real playbook should be Bangladeshi politics. The conviction of the leader of the Bangladeshi opposition, Khaleda Zia, is just the latest gambit in a decades-long battle between the country’s two formidable leading ladies. In Bangladesh they call them the Battling Begums – where “begum” refers to a Muslim woman of high rank. But there is nothing ladylike about their conflict. The vicious enmity between the current prime minister, Sheikh Hasina, and her great rival, Khaleda Zia, has dragged the country into a spiral of violence with bus bombs, disappearances and extrajudicial killings becoming sickeningly regular occurrences. It wasn’t always like this. They actually worked together in the 1980s to oust General Ershad, a military dictator, and restore democracy to Bangladesh. Both women are political royalty, scions of leading figures in the independence movement that saw Bangladesh created out of what was then East Pakistan in 1971 after a bitter war. Tragedy prompted both to enter politics. Sheikh Hasina’s father, Sheikh Mujibur Rahman, is celebrated as the founding father of independent Bangladesh. He was the nation’s first president, but was assassinated in 1975. Khaleda Zia’s husband, Ziaur Rahman, was another independence hero – a key military commander. He founded the Bangladesh Nationalist Party (BNP) in the late 1970s and became president in 1977, before he too was assassinated, in 1981. But, having combined their forces to defeat Ershad, they turned on each other, and power has pretty much shuttled between them since the early 1990s. At the moment Sheikh Hasina and her Awami League party are very much on top, having audaciously outmanoeuvred her rival and ruthlessly entrenched her power. She won the last general election, back in January 2014, even before the polls opened. It wasn’t because her supporters had been stuffing ballot boxes: the BNP decided to boycott the vote. One of the reasons was to protest against the charges of misusing orphanage funds which saw Khaleda Zia jailed this week. As a result Sheikh Hasina’s Awami League candidates were uncontested in 153 of the 300 parliamentary seats – a clear majority. “Didn’t other candidates decide to stand when the main opposition pulled out?” I asked one grizzled observer of Bangladeshi politics. He sighed heavily. “Of course they did. They just chose to withdraw, or maybe they were ‘persuaded’ to do so,” he suggested with a wry smile. Bangladeshi politics is marked by a lot of what he characterises as “persuasion”. Since winning the last election, Sheikh Hasina has hounded the BNP’s leaders and banned its coalition partner, Jamaat-e-Islami. 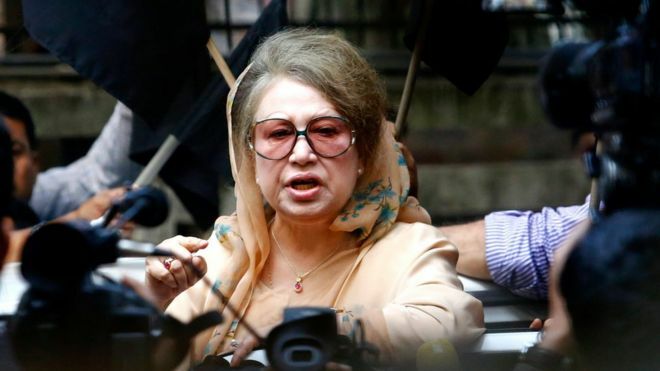 And the five-year sentence handed down by the court this week could see Khaleda Zia excluded from another general election, due in December, thereby potentially handing Sheikh Hasina a fourth consecutive victory. That’s because under Bangladeshi law anyone imprisoned for more than two years cannot run for office. Ms Zia is expected to appeal the conviction and, so long as that is pending, she should be able to stand. “Nobody will be allowed to score a goal this time on a playground void of opposition,” she told party activists the day before sentencing. But she knows there’s a teetering tower of more than 30 other criminal charges pending against her. Ms Zia has been accused of everything from corruption to sedition. Her supporters insist this is all part of Sheikh Hasina’s attempts to undermine her and her party. They say hundreds of BNP activists were arrested and detained in the run up to the verdict. 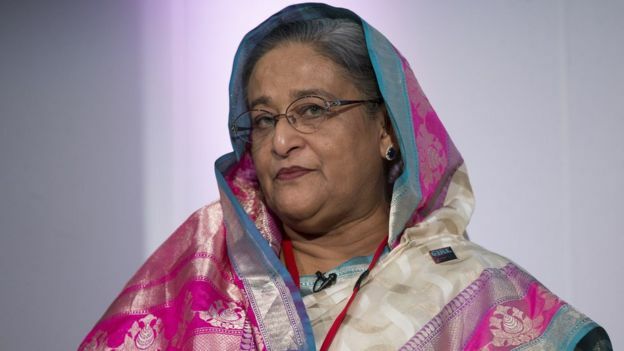 Last week the international campaigning group, Human Rights Watch (HRW), called on Sheikh Hasina to stop all such arbitrary arrests and detentions. It accused the government of “violating the rights to free expression and peaceful assembly,” by preventing opposition supports from demonstrating. 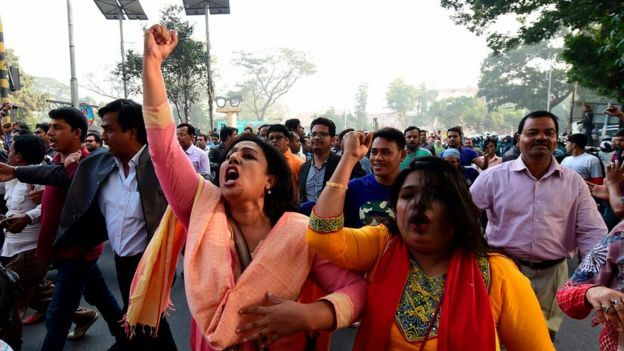 Bangladeshi security forces used tear gas and batons to control thousands of Ms Zia’s supporters who took to the streets following the verdict. Brad Adams, the Asia director at HRW, called for restraint. “The Bangladesh government’s claims to be open and democratic ring hollow as it cracks down on political debate,” he said. But the truth is many Bangladeshis have grown tired of the begums and their endless battles. Try and start a conversation about politics in a Bangladeshi “dhaba” – a street café – and you always get the same hushed tones and pained expressions. Bangladeshis seem exhausted and disillusioned by the personal animus that fuels so much of what happens in politics here. That doesn’t stop the two women at the heart of Bangladeshi politics, though. Both are now in their 70s, but neither is ready to throw in the towel. You might imagine this week’s verdict would change that. 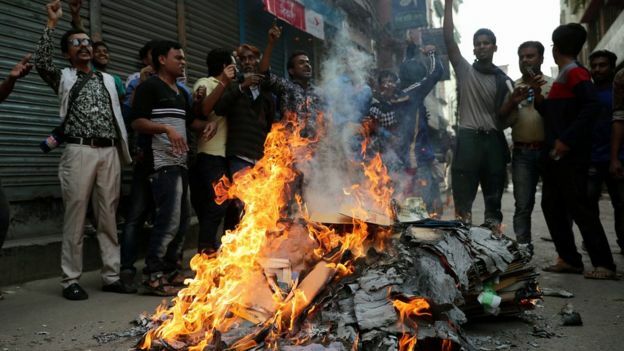 Many commentators believe this marks the final collapse of Bangladesh’s two-party system. But Khaleda Zia is having none of it.